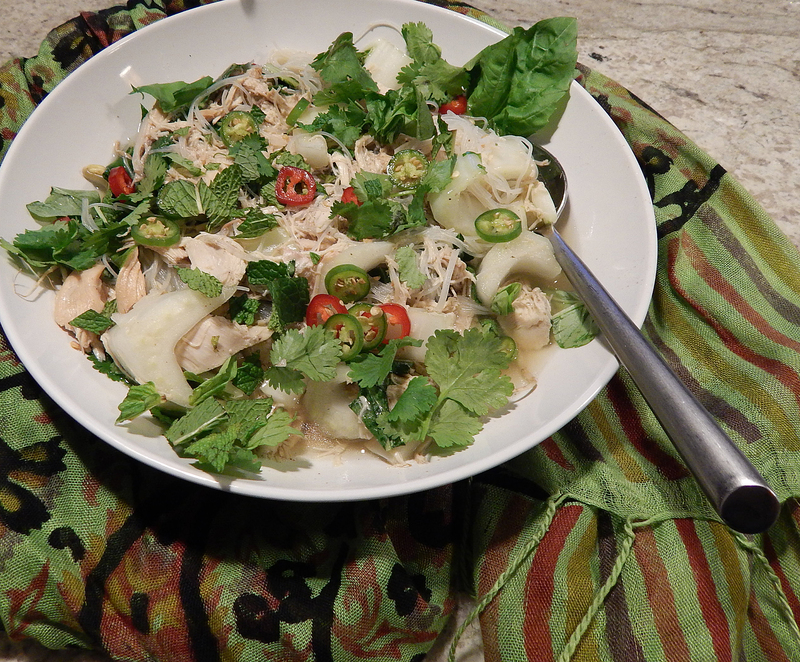 Chicken Pho, a classic Vietnamese soup, is a perfect recipe for a slow cooker. The chicken and seasonings of star anise, cloves and ginger simmer all day in the crock pot, welcoming you home with an alluring aroma. Serve with the essential garnishes for pho soup—fresh herbs, bean sprouts, chiles and lime—and let everyone top their own. Serve chile-garlic sauce for those (like me) who want more heat. Hey what’s not to like? This easy, healthy meal is high in potassium, low in saturated fat, is heart healthy, high in calcium, and is gluten free. We found it flipping through a recent copy of Eating Well magazine. Since this was a weekday meal, we portioned out the seasonings and prepped the chicken the night before so that we could throw it all together in the crock pot before heading out the door for work in the morning. To prep ahead: Combine seasonings with broth; prep chicken; cover and refrigerate separately for up to 1 day. | Equipment: 5- to 6-quart slow cooker (we used a 7-quart). Tip: Add star anise, named for its star-shaped pods, to Asian-inspired dishes to lend distinctive licorice-like flavor. Look for it with other bulk spices in natural-foods stores, in Asian markets or online at penzeys.com.